Opulent, impressive, and triumphant, the Amouage Jubilation XXV Man Eau de Parfum Spray is the scent of a man who carries the essence of his philosophy and sophistication throughout his years. The scent is abundant with rich, honeyed notes and smoky woods that imbue warmth and luxury. Languorous, velvety and lavish, this is a precious object to treasure. Amouage Jubilation XXV Man Eau de Parfum Spray is rated 5.0 out of 5 by 5. Rated 5 out of 5 by Paul99 from Magical, inspirational and unique This is like nothing else; it opens with the most amazing blackberry note which is beautifully underpinned by oud and frankincense. This is an extremely complex, opulent fragrance with great longevity and very good projection. Pricey but worth it; the quality is sky high and you will almost certainly be the only person wearing this. My only issue with this is versatility; this is a special occasion scent. It makes you feel regal, special and unique; a magical fragrance. Rated 5 out of 5 by FlorianK from Amouage... gifts for kings.... This is truly a masterpiece and a jewel in the Amouage collection. As always with this kind of perfume you can expect only the very finest ingredients and a MONSTER longevity (I got nearly 12 hours!!) First I get a lovely accord of berries and oppoponax. This is not the usual berry accord, but something so incredibly sensual and deep it is surreal. Then Oud and frankincense join and add to the oomph of this juice. Jubilation's sillage is not mind-blowing but well above average. But do not over-spray this, as its beauty lies within the fine application. It will linger for hours and hours and enchant you and those close to you. 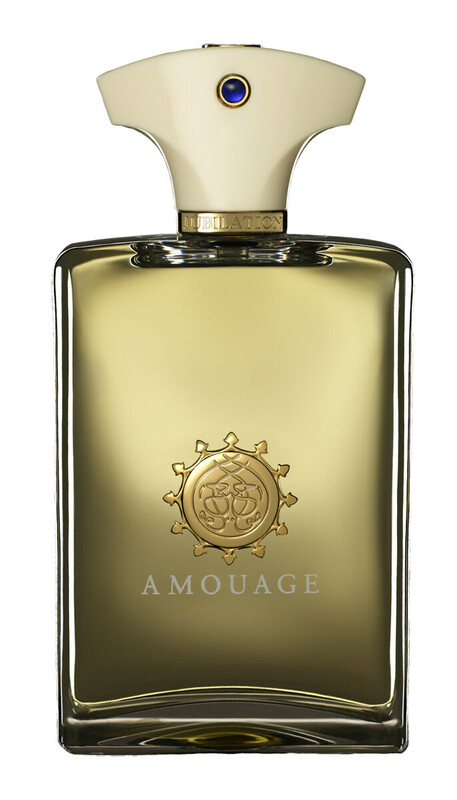 For those that would like something equally royal I would suggest testing Amouage Epic, another gem! The sweet note of the berries has vanished here and makes space for an outstanding composition of smoky frankincense with Oud and Leather. For the less oriental, avant-garde man I would suggest testing Gould also by Amouage. A wonderful floral, musky perfume. Rated 5 out of 5 by TheMax from Wonderful I got a sample a few months ago and loved this fragrance, although it seemed rather short lived at first at around 4hrs ish, on the second wearing it lasted longer 5 - 7hrs on my skin. This is a honey,cinnamon and berry type sweet fragrance to start for around 4 hrs before the woody frankinsence & myrrh moves in gently. It's a very addictive fragrance, even when I thought it was wearing off after 5hrs it hadn't, others can still smell it long after i could not. Subtle but powerfull and on par with reflection man for me - it's joint favorite amoungst my amouage fragrance's.This is a quality fragrance but does not last well on all skin types so test this before you buy as some have reported as little as 3hrs longevity even though projection is excellent. Rated 5 out of 5 by Arturo from Excellence Personified Truly a masterpiece. Expensive but worth every penny, Jubilation XXV was the first fragrance I smelled from Amouage and still the best in my opinion. Jubilation XXV created by Bertrand Duchaufour is sophisticated, elegant and divine in virtually every way possible. From the darkened fruits, incense, woods & spices combine to create a sensual fragrance evocative of the desert and all its mystery, but still bearing heart and soul, something I feel the majority of high street brands all fail. Amouage fragrances have highly impressed me so far, and Jubilation XXV is no exception. Jubilation XXV begins on my skin with a fruity tone of dried fruits, blackberry-blackcurrant, a fruity tone mixed with honey, frankincense and a resinous labdanum note. The combination of these highest of quality ingredients stay for a while followed by the incense which smooths over in time and the, gaiac wood, oude, opponax and amber come out more and all the elements come together in a luxurious gourmand never at any time becoming overbearing. Overall, Jubilation XXV lasts over 12 hours on my skin and has a projection like no other. The first time I wore this out I received many compliments but had to admit to telling a few small one's in giving my answer as to what i was wearing. Jubilation XXV is an amazing fragrance that is set to be a classic, luxury item, perfect for special occasions. I would thoroughly recommend this product. I would also like to say a special thank you to Escentual and their professional team on the excellent, helpful and efficient service they provided. I look forward to dealing with you in the very near future.